On your wheelchair vacations in the Florida Keys there are different wheelchair sports you can and should include depending on your skill level and physical strength. Listed further below, you'll find different diving and fishing charter companies that make it possible for disabled people to enjoy a variety of handicap sports. Traveling with disabilities doesn't mean you can't get out on the ultra clear and multi hued water. It just means you have to be more selective and make the necessary inquiries about which charter is most capable of accommodating handicap activities. When it comes to sports for people with disabilities it's only practical that you know your limitations. However, it's critical that you determine the limitations of the Florida Keys charter companies when handicap accessible vacations. If you're a disabled diver and are wondering about the opportunities Florida Keys diving holds in store for you, you'll enjoy this inspiring interview with Torsten Gross. If you're planning on a scuba diving Florida Keys trip then you already have some level of diving certification. 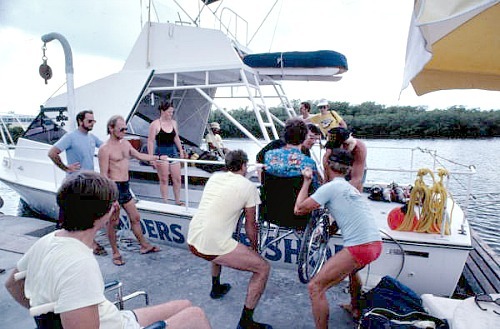 Depending on the degree of a person's physical disabilities will determine which Florida Keys diving charter will be most suitable for you as a disabled athlete. For example, the majority of Florida Keys diving charters will be able to help you get into the water. However very few have any sort of special handicap lifts or wheelchair ramps to make it easier. This disabled sports fact is also important for anyone planning a Florida Keys snorkeling trip. Typically you'll need to jump into the water or climb down a ladder. 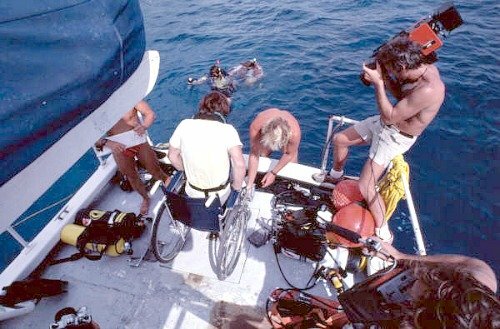 If your physical disabilities are so great that you're unable to do this on your own, you'll need to question the snorkeling tour company as to how they plan on safely getting you in and out of the water. One of the other wheelchair activities that's not off limits is Florida Keys fishing. For those with adequate upper body strength, this is definitely one of the better disability sports to pursue. However, it's important to know in advance that there are boundaries as well as limitations for people with physical disabilities who are planning a fishing trip. Depending on the handicapped individual, certain types of Florida Keys fishing trips such as flats fishing will not likely be possible, especially if you're wheelchair bound. However, if you're able to get in the boat with assistance, if you're willing to be lifted in and out of the boat, if you can sit without a wheelchair, if you have reasonable upper body strength and balance, then you'll have more options in choosing your Florida Keys fishing trip. Backcountry fishing is fun, productive and very safe. The challenge is that the water in the backcountry is very shallow, in some places only a few inches deep. To traverse these clear waters, the fishing boats require shallow drafts. They're also relatively narrow and usually 20 feet or less in length. This means it's impossible and unsafe to have a wheelchair onboard a backcountry skiff. Backcountry fishing charters are therefore limited to people with disabilities who can safely be out of a wheelchair for at least a few hours. 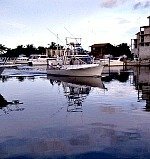 Fishing charters typically run ½ day, 2/3 day and full day, but they can be customized to suit your needs. Another issue facing wheelchair athletes is that many of the boats used for reef and wreck fishing have a center console. This means the layout of the boat is not spacious enough or conducive to accommodating wheelchair bound people. 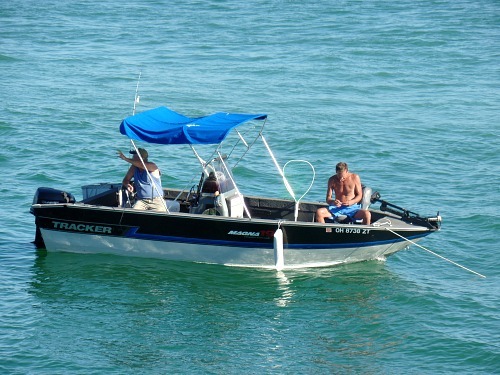 Only those traveling with disabilities who can safely stay out of their wheelchair for several hours should consider this type of fishing boat as an option. 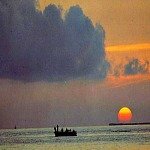 These types of Florida Keys fishing trips will also take you out several miles from shore. Typically the fishing charters go for a minimum of a ½ day, and the head (restroom) on most fishing boats are below deck. This means you must be able to maneuver steep stairs if you need the bathroom. If you're only going out for a few hours, it's likely not critical that you have access to the head. However, if you're going out for a full day fishing trip, that's something you need to consider. Deep sea fishing trips, depending on the size and layout of the boat are usually able to accommodate a disabled person with a wheelchair. Again though, the person will likely need to be assisted on and off as most fishing charters do not have handicap ramps or wheelchair lift. The heads in these boats will often be below deck, so you'll once again need to consider the duration of your Florida Keys fishing trip. If the deep sea fishing charter's boat can accommodate your manual wheelchair, you should inquire as to how they plan on safely securing it (and you). This is important as Florida weather can change rapidly and the water can get very rough. The last thing you need to be doing on your fishing vacation is rolling around the deck struggling to avoid going overboard. 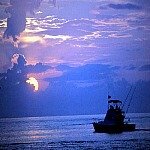 When planning a Florida Keys fishing charter it's also advisable to ask what species of Florida fish are currently in season. Once you know this, you can ask questions as to which type of fish would be safer for you to catch. Depending on your physical condition, you may not have the upper body strength required to battle it out for hours with a sailfish, marlin, amberjack or shark. However, dolphin fishing (mahi mahi/dorado) or fishing for yellowtail might be easier for you, and both are a lot of fun to catch. The important thing to remember when it comes to wheelchair sports, is that your Captain has the necessary experience and skill. 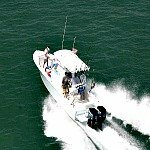 He or she will know what the boat and crews limitations are, and they'll know what they can do to make your fishing trip as safe and fun as possible. It also appears that in almost every instance, if not all cases, that charters simply can't accommodate an electric wheel chair. The size and weight is the restricting factor. This means you'll need make sure your travel wheelchair is manual and if possible, a folding wheelchair, so they can more easily accommodate you. You'll also want to consider where the charter companies are located and how you're going to get to them. You'll find that there are a number of handicap transportation options available to when your on your vacation in the Keys. Remember that dialogue is the key to having a successful Florida Keys vacation. Ask questions, explain your situation, and listen to what the Captain recommends. If you're not comfortable with what they can do, don't go. Likely there's another Florida Keys fishing charter that has successfully worked with disabled people ensuring everyone onboard has fun. In the box below you'll be able to link to our fishing charter pages broken down by area. Depending on where your vacation takes you, you'll want to check out the fishing charters for that region. 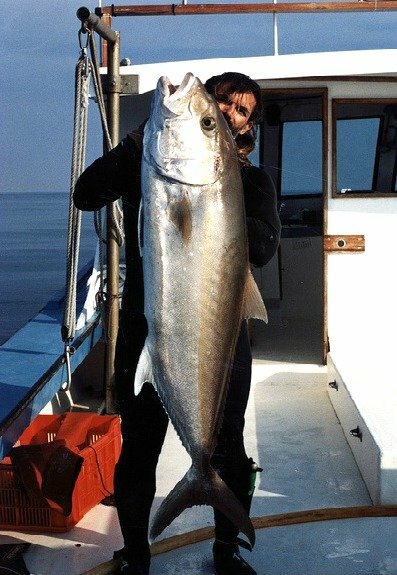 When on the appropriate page you'll then be able to see, research and search for the various fishing charters broken down by a variety of factors including where they fish, what they fish for, and the type of tackle they use. This will give you a chance to see which companies provide the type of fishing charters you're interested in. You'll also be able to check rates, and once you've been able to isolate the ones that are of interest you can then confirm with them their ability to provide adequate accessibility for you. Remember, you must inquire as to how wheelchair accessible or handicap accessible they are, as definitions of these terms vary from charter company to charter company. Also, most fishing charters do not have wheelchair ramps, but they can assist you or lift you onto and out of the boat. You'll also need to find out if they have room for your manual wheelchair, and don't forget to inquire as to whether you'll have access to the head. This is especially important if you've planned a 2/3 or full day fishing trip. When planning handicapped vacations, use this Florida travel guide which highlights the various Florida Keys diving charters. This information will assist you in finding the best company that has help for disabled individuals. I also strongly suggest that you qualify what each charter considers "wheelchair accessible or handicap accessible" before you book. 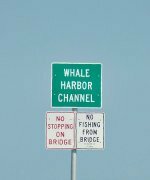 As you read through the different Florida Keys charters listed below, you'll see that I've intermixed the words "wheelchair friendly / wheelchair accessible" and "handicap friendly / handicap accessible". This doesn't mean that a handicap friendly or handicap accessible charter isn't wheelchair accessible or friendly. When you see a charter listed below that's in a category you're interested in, you'll obviously want to call to find out how much they charge. At that point spend some time questioning them to determine just how "wheelchair accessible" or "handicap accessible" they truly are. This way you'll know what to expect, and if you're not happy with their answer, call someone else on the list. You'll find that some charters are definitely more wheelchair friendly then others. However, you'll find that all of these fishing or diving charters will do their best to accommodate you and to ensure you have a safe, good time. For your convenience the following wheelchair sports list is broken down alphabetically by Florida Keys activities. For each activity it's then broken down by region, going geographically southeast from Key Largo to Key West, as opposed to displaying the areas alphabetically. This way you'll be "working areas" that are in proximity to each other and will make planning your vacation even easier. No matter what your physical disabilities are, as long as you ask questions and explain your situation, you'll find that these "wheelchair sports" companies will work hard to make your Florida Keys fishing, snorkeling or diving vacation safe and memorable. You'll also find that the Florida Keys offer more than water sports for serious wheelchair athletes. Florida Keys marathons including the Seven Mile Bridge Run are exhilarating race events held throughout the year. There are also a vast number of other fun activities for adults with disabilities, special needs children and disabled veterans you'll want to look into. These activities range from museums to sunset cruises, swimming with dolphins to exploring hiking trails. Planning your Florida Keys vacation will be fun. However taking advantage of the area's many wonderful activities will be even better once you know where you can go and what you can do!